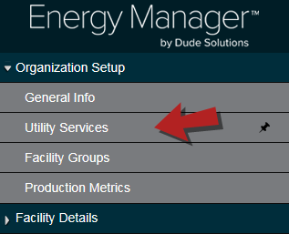 In Energy Manager, vendors are the companies that provide a utility service – like electricity, natural gas, water, refuse, etc.– and then send a bill for the service. Click on Organization Setup, and then click on Utility Services. On this page, check the services that your Vendors provide. This is a preset list, however you can add up to two Custom Services. 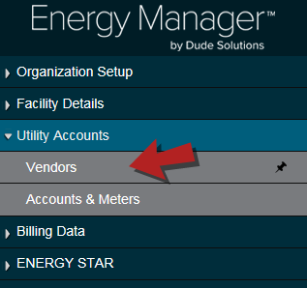 Click on Utility Accounts, and then click on Vendors. You have the option of entering a Vendor Number, Description, Website URL, and Billing Address but these are not required fields. Select the Services that this Vendor supplies. This list of services comes from the Utility Services list activated prior to adding the vendor. Click Save to add this vendor.